This last summer, one of my best friends in the whole world and I went camping to test out my new hammock setup. He wasn’t nearly as impressed with things as I was. Well, we set out to go and spend a weekend up in the hills and try out my first hammock outing. 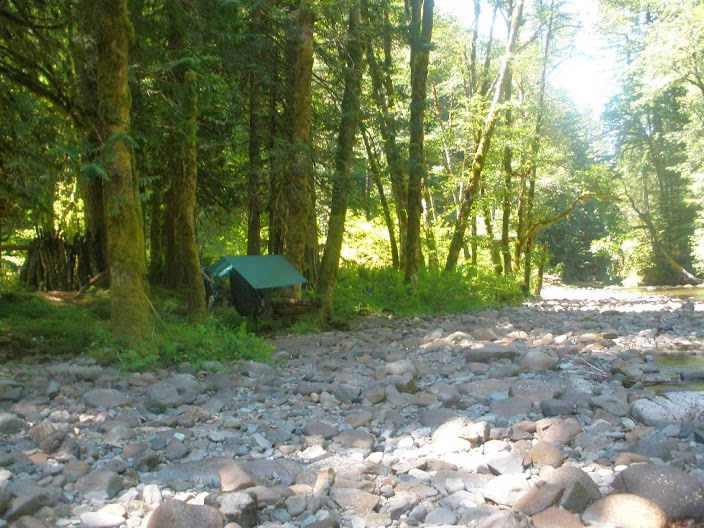 I have been using tents, tarps, and various configurations thereof for years. Most recently, I have found that using an insulation bed of fresh tree boughs has been my camp of choice. This doesn’t work so well when Park Rangers are watching your every move. They have a habit of freaking out on you when you start cutting down any low hanging tree branches. To assist with getting things lighter and more “park accommodating” I have started buying lighter and more mainstream equipment so I have a choice in how I camp. Cutting weight had to start somewhere so I started with carrying equipment and shelter as my first weight saving changes. Getting an Osprey Aether 70 helped a lot, but the real transition from heavy gear to “as light as possible without spending a crap load of money” did truly take place with getting off the ground. The first thing that I really did was modify my sleeping arrangements. I will cover other things that I did later on. Keep in mind that I have suffered from back pain due to injury so I need a really soft place to sleep. This made me do some research into how to handle my problem, thus discovering hammocks. Now, I don’t really do things halfway when I take a plunge. I just go for it with the best information I can find, then adapt or modify as needed. So I went to Amazon with my list of needed gear and started filling my cart. The gear that I purchased was an ENO Double Nest, ENO Bug Net, Aqua-Quest Sil Tarp 10×7 ft, Whoopie Slings but buy 2 for a ridgeline, Hennessy Snakeskins, webbing that I made tree straps out of, and an underquilt that I had my mother make. For an overquilt, I just used a MSS. By swapping all this out from my Thermarest Pad and Eureka tent (says it weighs around 7 lbs my mine always weighed over 9 for some reason) I was able to drop about 5-6 lbs and an unbelievable amount of space from my pack. Most importantly, I was able to sleep much better than the 1/2 inch of foam and air pad that the Thermarest provided. There are a few tricks, however. So here are a few things that you need to take care of almost immediately if you do swap over to a hammock. Get rid of the carbiners that come on the ENO Double nest. Replace them with some lightweight climbing ones like these. The “stock” ones are about 2 lbs a piece or something crazy. This is no joke. They are solid steel and I call them “Hammock Girders.” You can actually drop the carbiners totally if you want, but it does make it easier for setup and take down with them. Turn one set of Whoopie Slings into a ridgeline for your hammock. This helps to get you the right slack so that you can sleep diagonally. Either that or tuck more of the Amsteel into the compression section so that it will hold as a ridgeline. If not, they tend to slip…. A lot. Let all the ropes and extra straps, etc, hang or you will get water dripping down into your hammock while you sleep. So here is a good picture of the whole thing set up. Here is the whole campsite. 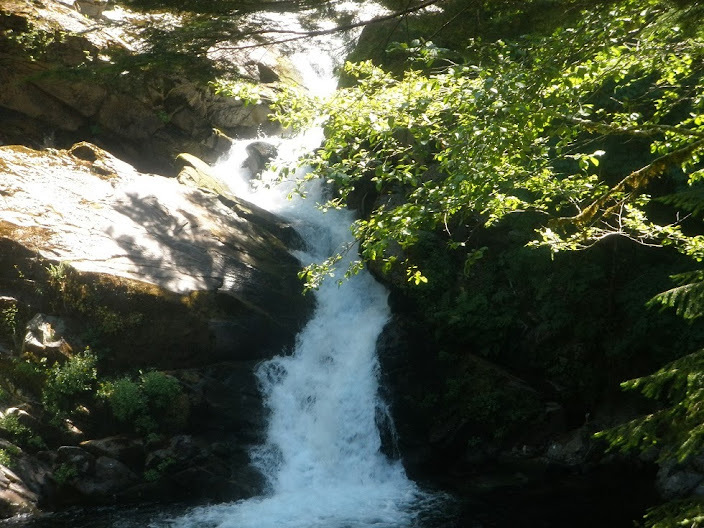 Here is a great view of one of the waterfalls I ran into along the river. All in all I loved the way that the hammock packed and functioned. The ridgeline made a huge difference in my comfort. There is a certain happy medium that you have to find between too slack and too tight. If you end up making the move over to hammocks, you might want to set it up several times to get used to the process not to mention how you like it set. Look up Shug on YouTube. He has some really good instructional videos. I have linked his page here. Check out the book The Ultimate Hang. I hope that this has been relatively informative for those that are thinking about making the transition to the trees. There is a lot to the change, but it is well worth it for ease of packing in addition to the saved weight. Check it out and see you in the trees!!! 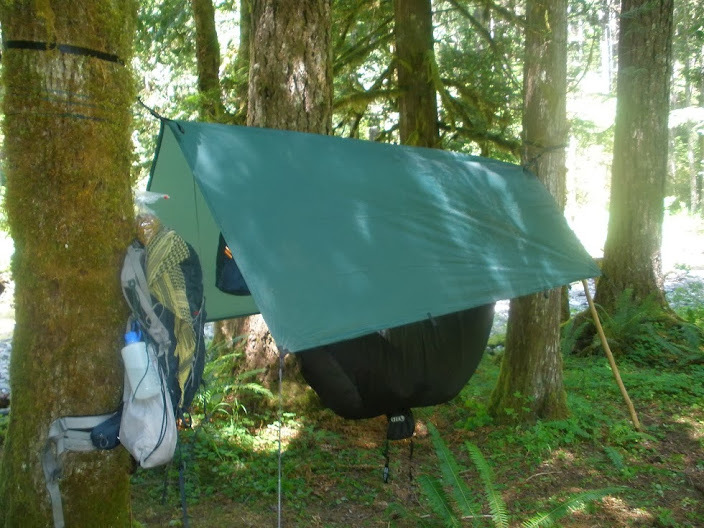 This entry was posted in Hammocks, Miscellaneous and tagged bushcraft, ENO, hammocks, hanging, tarps, whoopie slings on March 6, 2014 by Woodsbum.